One of the biggest problems in coping with being rejected by your children is the manner in which you are forced into a mirroring of the good/bad splitting which is going on in your child’s mind. 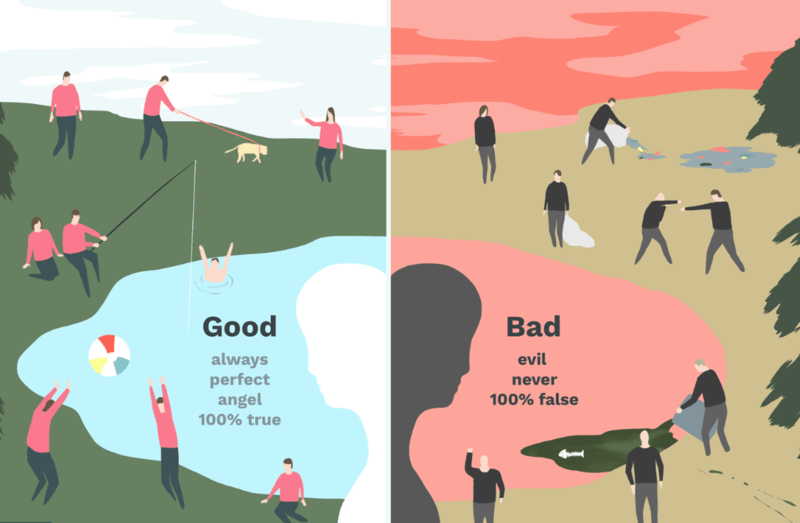 The good/bad split is the belief that everyone is either good or bad and that the world and all experiences within it can be divided into good and bad or right and wrong. Primed for splitting by the child’s shutting down of the relational systems, pushed away and blamed, many rejected parents feel that the world has projected all that is wrong onto them. This creates a tendency to build a huge defensive wall and a determination to prove to the outside world that what is being said and done to you is wrong. It is a ghastly trap for anyone to be caught in and avoiding that trap is essential for all parents whose child enters into the shutting down reaction which is seen in splitting in children of divorce and separation. Splitting is defence mechanism which is seen in Borderline or Unstable Personality Disorder. I have written about it many times on here in the way that it affects alienated children and often, both of their parents. In the alienating parent, behaviours which are conversant with BPD or Narcissism may be present with or without formal diagnosis and in the rejected parent, as a result of the child’s rejection of them a mirroring of the splitting often begins. This is a problem for alienated parents because in mirroring the behaviours of the alienating parent, there is a fogging of the reality of what is happening around the child. This is, in my view, the reason why so many people fail to understand the reality of what psychological splitting does to a child and how it sets off a train of reactions which lead to the belief that cases of alienation are always about high conflict or dysfunctional families. One of the first things we do with rejected parents at the Family Separation Clinic is help them to stabilise their responses, learn how to manage the experience of being rejected and reclaim the health which is rightfully theirs. A health which the alienated child will depend upon for recovery. A health which is fundamentally present but which is eroded by the desperation felt during the alienation journey. Splitting is an infantile defence mechanism, it is something that we should all be over by the time we reach the age of 3. Returning to splitting as a defence against impossible dynamics, is something that we should all recognise as being unhealthy and problematic in the world, which is not divided into good and bad, right and wrong, as neatly as splitting leads us to believe it is. Splitting causes the belief that there are right ways and wrong ways to do everything. It causes the belief that people are either good people or bad people. Largely what it does is cause people who suffer from it to believe in good and evil. The polarisation of the feelings is very strong in split thinkers who readily fall for the idea that others are either for them or against them. Split thinkers are very easily manipulated, they idealise others until the others are perceived to let them down. Then they demonise them, turn on them and do their best to harm them as a method of revenge for not upholding the idealisation in the first place. Split thinkers are easily persuaded into conspiracy theories and easily aligned with those who they believe have the answers to their problems. They are vulnerable people whose view point is narrow and judgment of others is eroded by the telescopic lens they look at life through. Becoming a split thinker as an alienated parent is harmful to your wellbeing and to your child’s chances of a healthy future. When everyone in the family around the child becomes split in their thinking, the transmission of intergenerational haunting in the form of the alienator’s unhealthy familial patterns being passed down the line, becomes a reality. In truth, even in the most severe cases of parental alienation splitting in the alienated parent in terms of a belief that they are wholly good and the other parent is wholly bad is unhelpful. Maintaining the capacity to be flexible in mind and non-judgmental as far as is humanly possible is an essential part of being healthy and critical in terms of your capacity to help your child when the time comes. How do you achieve that? By making sure that your mind is open, you read widely and that you make up your own mind about all things. Your mind is yours and yours alone. What you need on your journey can be found in many places. If you listen carefully you will hear that there are voices speaking the same language and working together all over the world. They may say things in slightly different ways, they may assist you differently but those who do this work share much in common. A desire to work together to create change. A desire to make as much information available as possible. A desire to create change for children and families which is sustained around the world. Split thinkers cannot see this, they are looking for the ‘truth’ which upholds their divided state of mind. Split thinkers don’t get help because they alienate themselves from those who could help and align themselves to those who will harm them further. Don’t be a split thinker. No one is perfect. This has been the issue with Parental Alienation. Be realistic about this subject, it causes so much emotional pain and distress to all concerned. I think even those doing the Alienation, must have something happening beyond their control. I do wish, I could undo what has happened to my grandson, I blame the Spanish Authorities for their weak attitudes towards this subject. Now 12 years on, we reap what they sowed. Broken relationships. I’ve long believed these views myself. Black and white thinking – Splitting – Stonewalling is a passive aggressive form of abuse – it is also cognitive distortion. It is also all too common in today’s society. Social media and the wider media is the worst cause for this cancer which mimics splitting – the ability to block and remove people from their social media “life” is, I think, breeding these disorders and promoting them as if they are normal human behaviours when in reality they display a total lack of empathy (aka humanity). Keep up the great work! Yet we insist on an adversarial family court system.. Go figure ..
You tell us to refuse to believe in God or in good and evil. THAT IS evil of you. Just saying. Jeannie Armstrong only a person who views the world as a child would make such a comment. Surely science disproved religion many years ago with simple carbon dating techniques. I’m not saying believing in God (or any other higher power) is good or bad it’s simply your choice but to judge – I’m pretty sure the bible has something pertinent to say about not judging people as you just have. If you have a religious belief or not, and I do have. The world is not not fair and just, that’s why we need more help on child access. Everyone is allowed to make a choice, and I have. Jeannie make that choice, and be strong. I know it’s difficult to make points clear on line. My son fell out with me because I helped his child. You will know the bitterness this subject brings. International Law, is far from where it should be at times. I’ve written on the subject many times. You know there is a large mountain to climb. I’m sure Jeannie will understand the point was not meant as she took it. To move this forward, we all have to put every effort into success for our children’s sake.